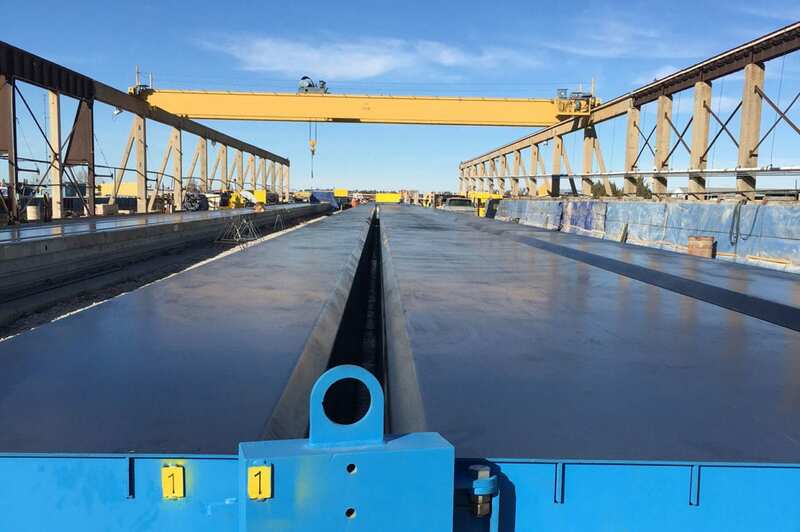 Prestressed Concrete Construction, located in Newton, Kansas, announces their product-line expansion to include double tees with panels measuring 12 feet in width, each individually prestressed up to 650,000 pounds (650 Kips). Poured locally, the new 12 foot double tee panels will have a 30-inch leg depth with a minimum 2 inch deck; additional product specifications include the prestressing of each 12 foot panel leg. The new equipment provides PCC with the capacity to better serve prospective warehouse and parking garage project owners. The plant expansion also includes upgrades to all onsite concrete batch plants and additions to their panel placement equipment fleet. “We are excited to offer our customers the 12 foot wide panel. Previous panel pours were limited to 8 foot panel sections. From a value standpoint, the 12 footers will reduce the piece count of their product orders, which, in turn, reduces both the number of jobsite panel delivery trips and the number of pieces required to install and complete the project. It’s a move that will decrease overall consumer cost, and provides an option that has been largely otherwise unavailable. PCC has always been known for superior products. The plant additions and improvements just up our game that much more,” said General Manager, Chris Goevert. Production is slated for December 2017.